In the pit area, 30 minutes ahead of the first LCQ, Scott Bloomquist and crew have the entire right side off the car. 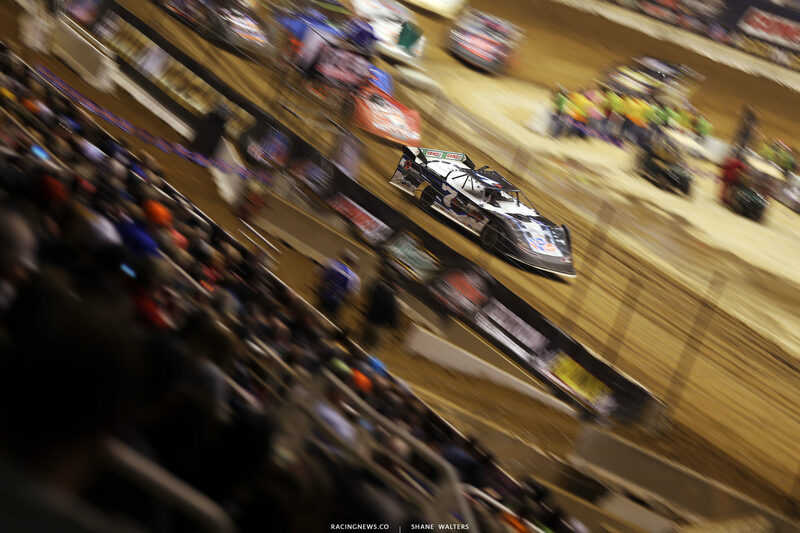 Bloomquist is scheduled to start on pole in the 3rd LCQ. He might be taking a provisional as the defending race winner. Brandon Sheppard and Michael Kloos will lead them to green in the first LCQ of the night. Green, Sheppard to the lead and Billy Moyer Jr is up to 2nd. 8 to go, they are already deep in lapped traffic. 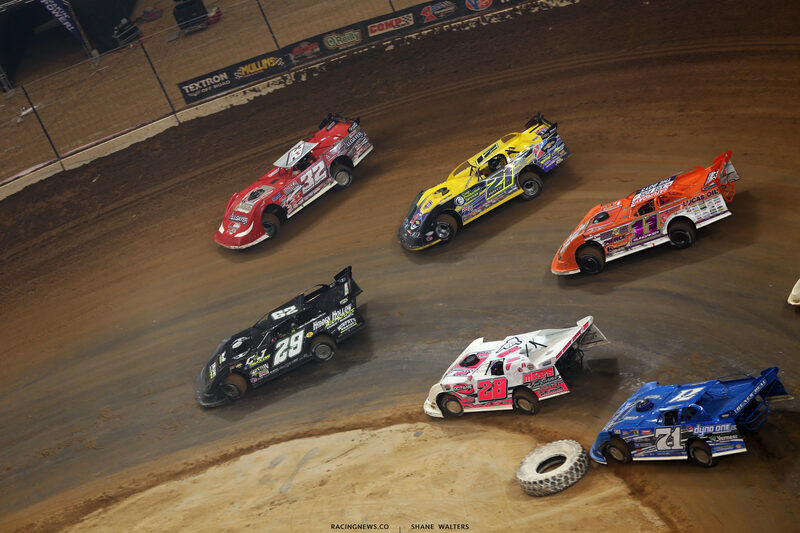 Sheppard splits the lappers as Moyer continues to lose ground. 3 to go, Schlenk, who started 6th is all over Sheppard. He looks to the inside, he’s there in turn 1. They ran side by side down the back. Caution, there’s a car stopped on the infield. Green, Sheppard drives away. He wins LCQ #1 and Schlenk is the other transfer. The track is bad fast and features multiple grooves. It’s completely different to the last two nights. Kent Robinson and Russ King set row one. Green, yellow followed by a green and a yellow. Green, Robinson leads into turn 1. King slots in 2nd. Robinson was running away with it early. However, in the closing laps, King has been running him down. King is there, he tries to door him off the bottom in turn 4, it doesn’t work. Robinson has picked up the pace. He drives away from King. They both transfer to the main. 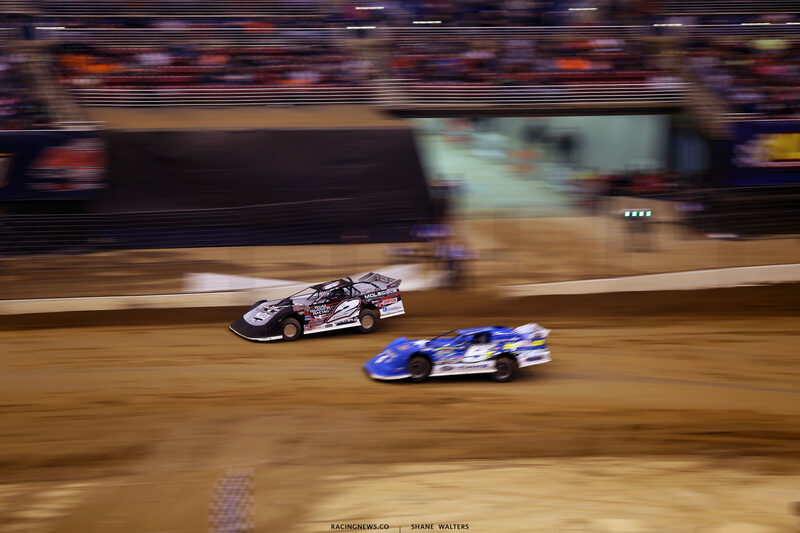 Scott Bloomquist and Casey Montague ine up on the front row. Green, Bloomquist is gone. Lap 2, caution. 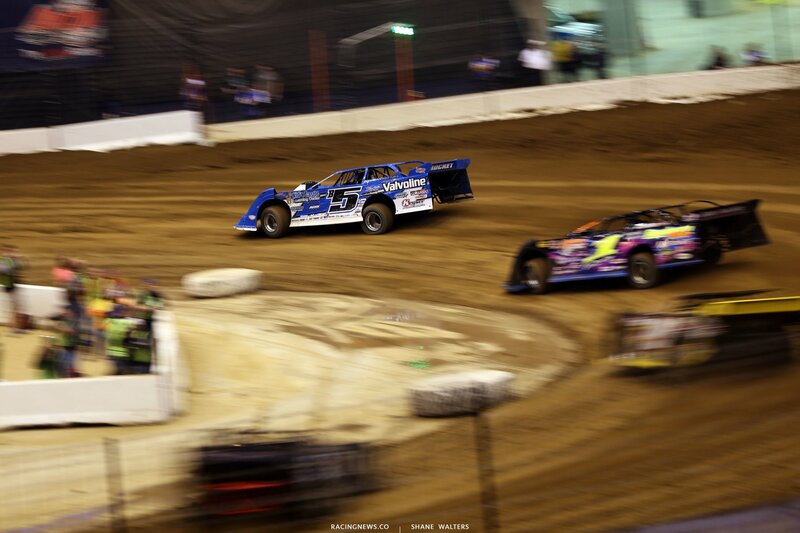 Green, no challengers for Bloomquist, he wins LCQ #2. Don O’Neal and Hunter Rasdon hit the track first. Green, O’Neal leads out of turn 2. Babb started on row two, he moved passed Rasdon on the bottom. Caution. Green, O’Neal leads Babb by two car lengths. He’s got the white flag, caution. Green, Don O’Neal wins the 4th LCQ. Allen Weisser and Randy Timms lead them to the start. 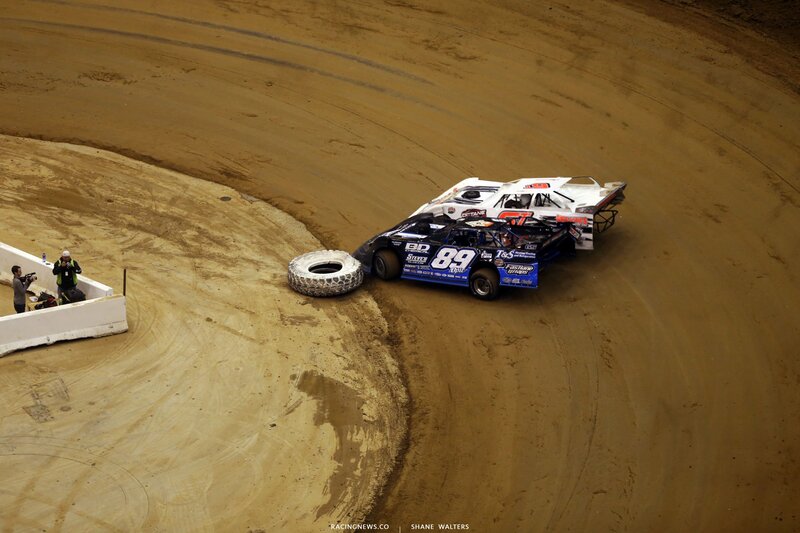 Weisser leads, Timms fights his way to the bottom by using up his left side door. Several cautions later, only 2 laps have been completed. However, Joey Coulter, who started 6th, is up to 3rd. He hits the cushion in turn 1, Coulter pulls even, on the outside of Timms. Coulter is coming but the caution fly’s. Green, Weisser leads but Coulter is the one putting on a show. He’s been working the cushion for awhile. He’s got a run off turn 3. Coulter pulls even with Timms, who’s not able to clear his exit to the wall. Coulter dives to the bottom in turn 1. He takes the low line away and completes the pass. Weisser drives off to the win. 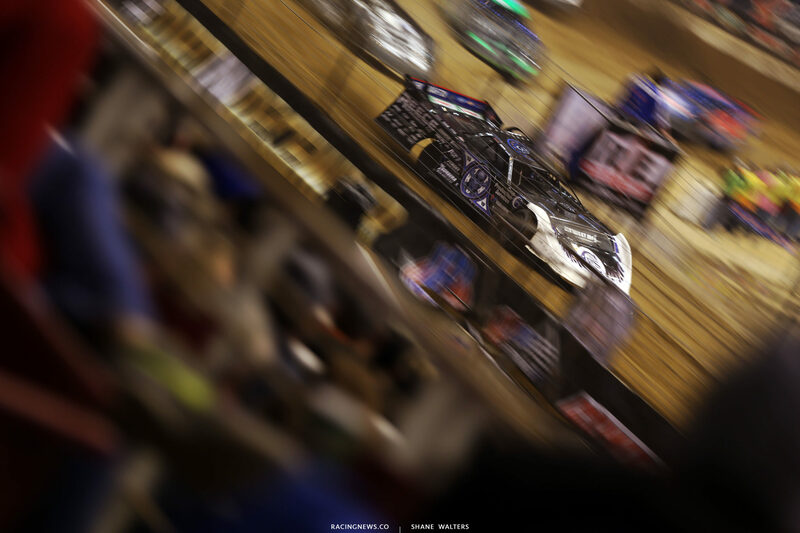 Darrell Lanigan and Mike Spatola set the front row in the final LCQ of the night. Lanigan leads into turn 1. Tim Dohm comes from outside row two, to 2nd. Spatola hits the cushion, he’s coming for the final transfer spot. Dohm hears him coming, he moves to the top to take the lane away. Spatola dives to the bottom. They cross and cross again. At least theee laps in a row they’ve crossed in turn 1. Spatola is looking to do it again but he clipped the inside berm off turn 2. Spatola gets sideways. Lanigan wins as Spatola takes the final transfer spot. 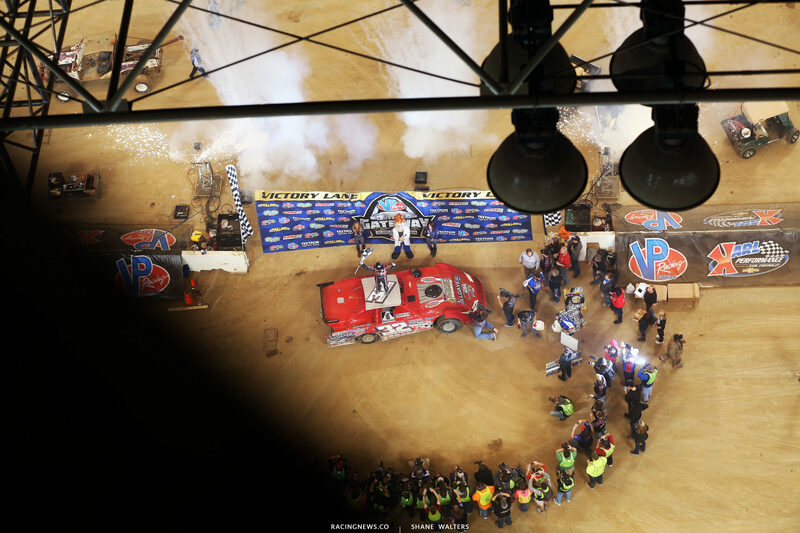 Driver intro’s, the light show and we’re going racing. Jason Welshan and Bobby Pierce lead the field to the green flag. Green, Pierce and Weldhan are side by side for the lead. Pierce is clicking around the top of the race track. Moyer Sr moves to 2nd. Lap 10, Gordy Gundaker through it in under Tanner English in turn 3. He clipped Tanner in the left rear but it sent Gordy around. Caution is out. Green, Moyer just did the same thing Gordy did. 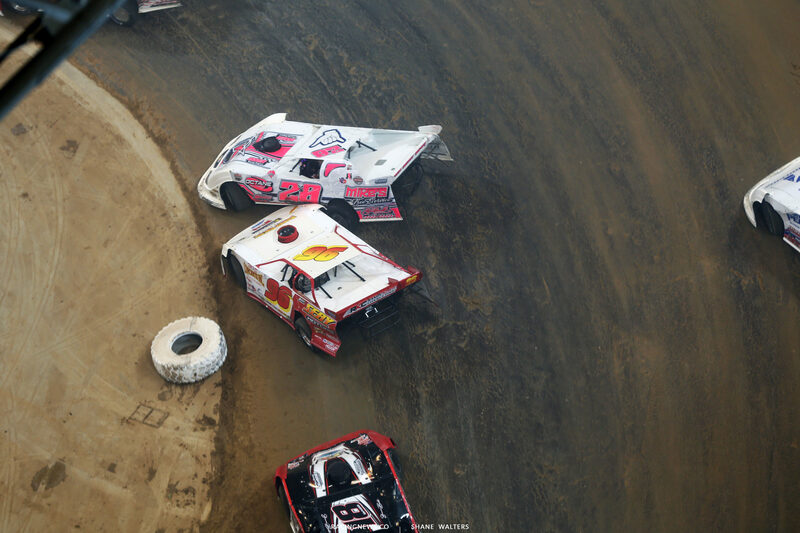 He clipped the left rear of Pierce in turn 1, it sent Moyer sideways in front of the field. They stack up on the brakes but everyone continues. 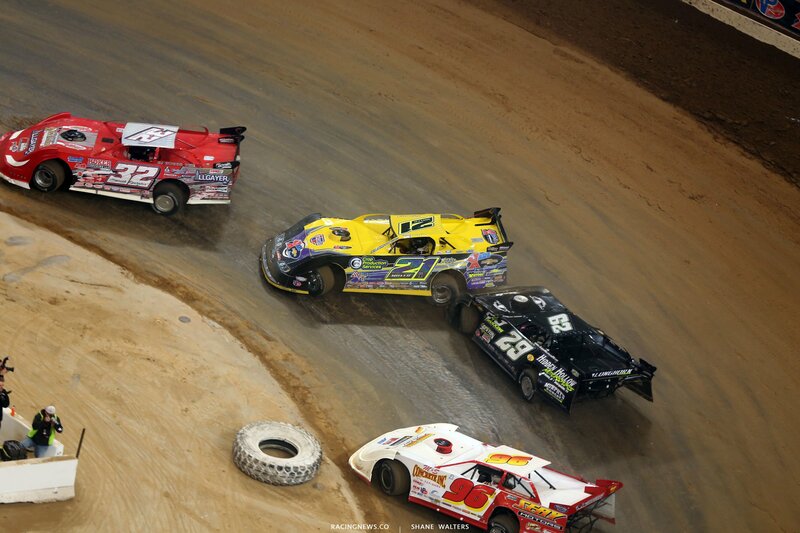 Caution is out, Moyer has stalled in turn 3. Green, Pierce leads Tanner English. Pierce has moved to the bottom of the track. 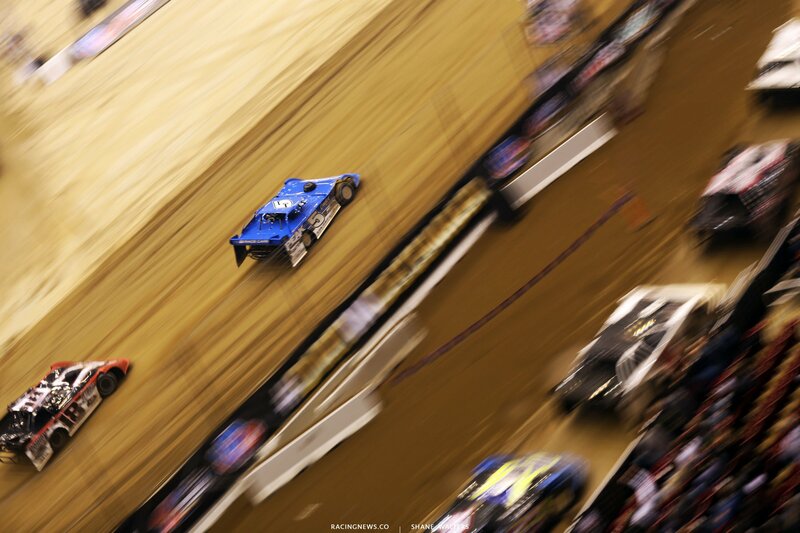 Shannon Babb is the only one in the top five running the wall. The track is slick as ice. 15 to go, Pierce is deep in lapped traffic. He jumps to the cushion to get around Gordy Gundaker. Tanner English stays low. Pierce has lost the lead! They continue to battle. The caution is out for Sheppard, Pierce will get the lead back. Green, 12 to go, English and Carpenter bangs doors in turn 1, again in turn 3. They stack up and Babb gets into the back of Tanner English. English is spun onto the infield concrete. Green, Pierce leads but Babb is coming! He just passed two cars on the outside, in one corner. The caution is out, the lap reverts, he’ll have to do it again. Green, Pierce is checking out. Babb is now bouncing his right rear off the outside wall to get it to turn. He sliding from the bottom to the top in turns 1-2, then catching the wall, on purpose and hoping it launches him off the corner. I wouldn’t say it’s working but the cushion is gone. 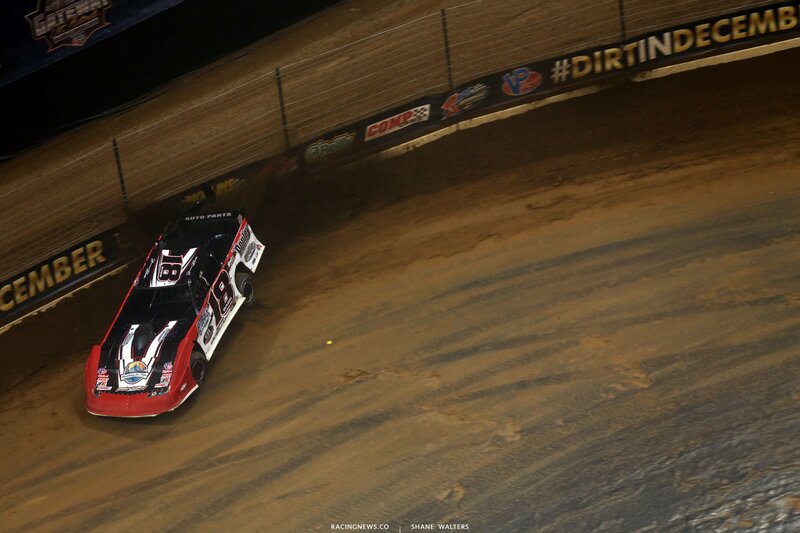 Bobby Pierce is driving away from the field. 3 to go, now 2 to go, the field needs a caution. Bobby Pierce wins the 2017 Gateway Dirt Nationals!